The name ‘ Bhutan ' appears to derive from the Sanskrit ‘Bhotant' meaning ‘the end of Tibet ' or from ‘Bhu-uttan' meaning ‘high land'. Though known as Bhutan to the outside world, the Bhutanese themselves refer to their country as Druk Yul or the Land of the Thunder Dragon. ‘Druk' meaning ‘Dragon' and extending from the predominant Drukpa school of Tibetan Buddhism . The documented history of the Kingdom begins with 747 A.D. with Guru Padsambhava also known as Guru Rinpoche who made his legendary trip from Tibet across the mountains flying on a tigress's back. He arrived in Paro valley at Taktsang Lhakhang also known as Tiger's Nest. Guru Rinpoche is not only recognized as the founder of the Nyingmapa religious school but also considered to be second Buddha. In the ensuing centuries, many great masters preached the faith resulting in full bloom of Buddhism by the middle ages. Although sectarian at first, the country was eventually unified under Drukpa Kagyupa sect of Mahayana Buddhism by saint/administrator Shabdrung Ngawang Namgyal in the 17th century. Ngawang Namgyal codified a comprehensive system of laws and built a chain of Dzongs which guarded each valley during unsettled times and now serving as the religious and administrative centre of the region. During the next two centuries civil wars intermittently broke out and the regional Governors became increasingly more powerful. At the end of 19th century, Trongsa Governor overcame all his rivals and soon afterwards recognized as the overall leader of Bhutan.The Governor of Trongsa, Sir Ugyen Wangchuck, was elected as the first King of Bhutan in 1907 by an assembly of representatives of the monastic community, civil servants and people. The country has now the system of democratic monarchy. 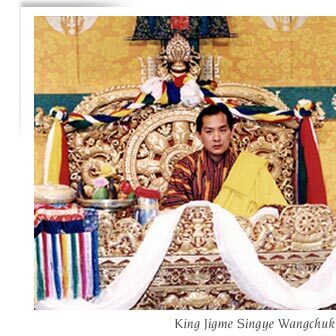 The monarchy has thrived ever since and the present King, His Majesty Jigme Singye Wangchuck, the first King's great grandson, commands the overwhelming support of his people. After assuming the throne in 1974, the present king continued his father's policy of pragmatic development by actively pursuing industrial progress, country wide education and medical care and at the same time ensuring country's cultural and natural heritage intact. Branch Office -Speed Holidays pvt.ltd. National Highway, Deorali, Gangtok - 737 102 Sikkim, India .